Caption slip reads: "Photographer: Jensen. Date: 1958-04-22. Assignment: Los Angeles vs Chicago Cubs. 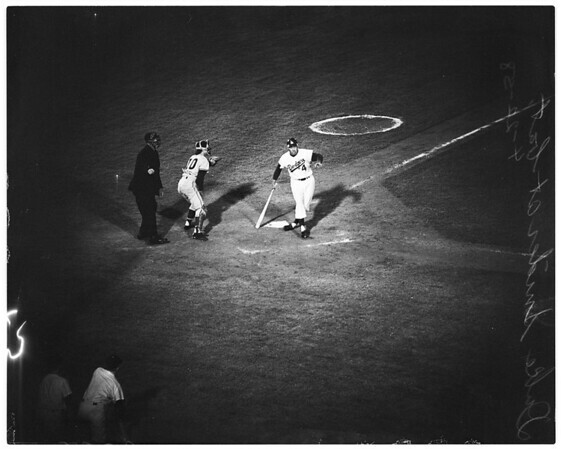 X-45: Bobby Thomson hits to Pitcher Podres and out on double play. Moryn out going to second and Thomson out to first. Catcher, Pignatano. Y-50: Podres sacrifice bunt sending Pignatano to second in second inning. Pitcher Hobbie makes play to first. Elvin Tappe catcher, Umpire at plate, Tom Gorman. X-51: Johnny Podres pitching to Bobby Thomson, fourth inning. X-1: Johnny Podres leaving game in sixth inning. X-3: Duke Snider at bat".